As someone who tries to read as much as possible, it isn’t often I go back and read a book I’ve already read. There are too many new books on my to-read list! A book has to be pretty special for me to take the time to read it again. But there are a few exceptions. We all have books that move us, and sometimes reading them once just isn’t enough. I have a few favorites which I have read multiple times, and would read again. There is something to be said about reliving a story you love and discovering things you may have missed the first time around. Reading a book a second or third time can feel like visiting an old friend. The book that stands as the one I have reread the most times (at least three) is White Oleander by Janet Fitch. I can’t get enough of her language, and I feel inspired by her prose each time I read it. I’ve also read The Time Traveler’s Wife by Audrey Neffenegger for a second time, which is also among the ranks of my favorite books of all time. Sometimes, in my excitement, I read a book too quickly and reading it a second time provides insight. 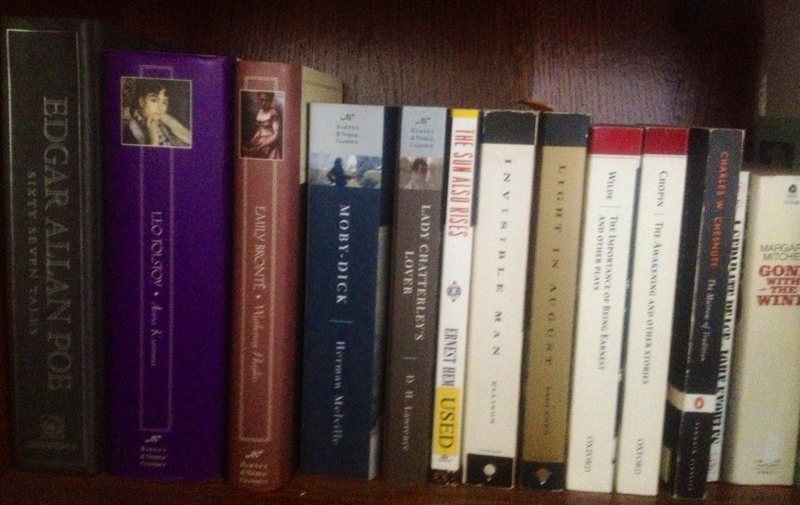 I’m also a fan of rereading classics, particularly those books from adolescence. I have children’s books on my shelf that I have revisited as an adult, like Charlotte’s Web, Peter Pan, and a favorite of mine growing up, The BFG by Roald Dahl. Some of the stories I’ve read again as an adult are very different from the versions we were told as children, for example The Wonderful Wizard of Oz and Alice’s Adventures in Wonderland. Both are very different from the movie versions we all watched growing up. One of my reading challenges for myself this year is to read books that were assigned reading in school when I hadn’t yet fully developed the appreciation for them. I just recently reread The Giver by Lois Lowry and it was a completely different experience from the first time I read it more than a decade ago. I am looking forward to reading The Great Gatsby again before the movie comes out this summer. Will you read a book more than once? What books have you read more than once? This entry was tagged Books, Reading, What I'm Reading. Bookmark the permalink. I’ve read several books more than once. The Phantom Tollbooth and The Fountainhead (I had to read that one 3 times to really get it) are the only ones I can think of now, away from my bookshelves. But I enjoy reading books again whether it’s because I don’t want to think, just enjoy, or because I feel I missed something important the first time. Thanks for reading! I agree, sometimes when rereading a book you see things differently or pick up on new things. I just commented on the blog you referred to, but have since recalled another book I have read more than once. You mentioned it- Alice in Wonderland. I read it as a child, but probably missed most of it. I read it again a couple of years ago, and was so enchanted that I immediately read it again, and third time aloud to my fifth grade class. They loved it. Some books are just too gorgeous and complex for a once over. I reread books when I feel like I’ve missed a big cut of details lurking below the surface. Stuff like symbolism, framing devices, foreshadowing, etc. Of course beautiful language also spurs me on a lot, and if the plot itself is complex I might reread it just to figure out better what the hell is going on. I will often fall into the trap of rereading a book at the expense of trying something new! They are typically my all time favorites. Some of my favorite rereads have been The Help and Gone With the Wind. Like you, it’s the author’s language and storytelling that pulls me in again and again.